Whose hands fashioned these vibrant images on rock surfaces ages ago, and why? Perhaps we may never fully discover the unknown artist’s identity or the impulse behind his art. Perhaps he was a great hunter, a chieftain or just the prehistoric man. Rock art are mixture of aesthetics, the then records and philosophy! Thus in unraveling mankind’s evolution from homo errect us to homo sapiens, these early images offer vital but very perplexing clues. Rock art is universal heritage which is an in-built logical relevancy of this art by a method, explained by a noted Anthropologist Prof. Saraswati, ‘diachronic hermeneutics which is threefold. First, enter into the present context of traditional arts; second, move backward in time to rock art; and third, construct a dialogical frame in which the visual text and the traditional context are compared...all these go for making a pluralistic world view to realize the cosmic dimension of rock art’. Early man started drawing on the walls some 40000 years ago B. P. (Before Present) during the Upper Paleolithic era. Nevertheless cultural traits perhaps continued even into the following Mesolithic Age 12,000 to 10000 B.P.In this era ancient man domesticated animals and expanded his activities. In the Neolithic Age (8000-6000 BP) The final prehistoric phase dawned with the discovery of copper during the Chalcolithic era(6000-5000 BP). These are the broad prehistoric periods during which rock arts are found in abundance worldwide. There are three kinds of rock arts--rock paintings, rock engravinga and rock brushings. Noted Rock Art expert Erwin Neumayer wrote ‘The touch glass surface of the quartizite, whose colours range from white shades to red, depending on the mineral context, in the best canvas for pictures in the mineral pigments’. The search of Indian Rock Art sites started in 1856 when the first Petroglyphs were reportedly discovered in Almora. 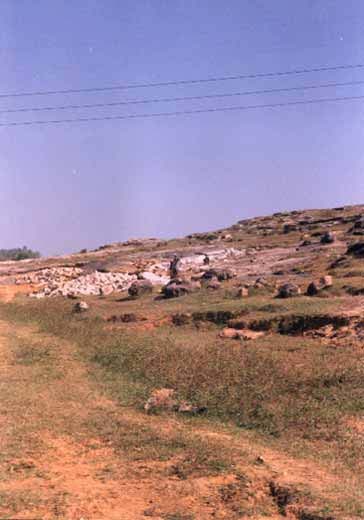 In Mirzapur district of Uttar Pradesh Archibald Carlleyle, First Assistant in the Archeological Office of British Indian Government discovered rock art sites. However, the present map of rock art sites were mainly discovered in the late 20th century. However, there are many rock art sites available in remotest places hidden beneath dense of woods or inaccessible mountainous terrain. V.S.Wakankar recorded that there are some 754 rock shelters in and around Bhimbetka. 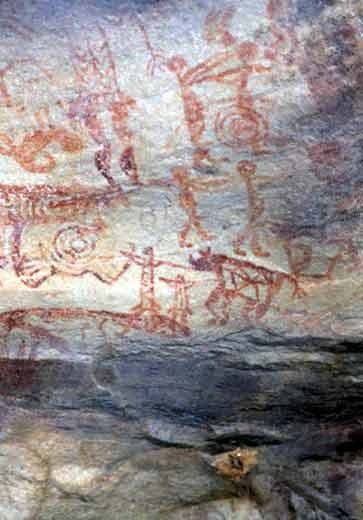 In the Betwa region some 157 rock shelters are found which are recorded by ‘Rock Art in India’ by K.K. Chakravarty and Shankar Tiwari. In Mrizapur there are around 250 rock shelters. Prof. Mathpal found many sites in Uttarakhand especially in the Kumaon areas.There are around sixty-eight sites have been found in this region. In Orissa in the western districts of Sambalpur,S undergarh etc. one can find rock art sites which is found in extension in the Chottanagpur and Chhattisgarh. Prof Mirta in Prehistoric India said that in Bihar, rock paintings were reported in the Kaimur range, Patesar, Jhania Pahar etc. Rock engravings are found in Singhbhum district. In the western India Gujarat remains the rich in rock art sites. The sites are hemmed in Baroda, Bhavnagar districts and alongside the Aravalli range. 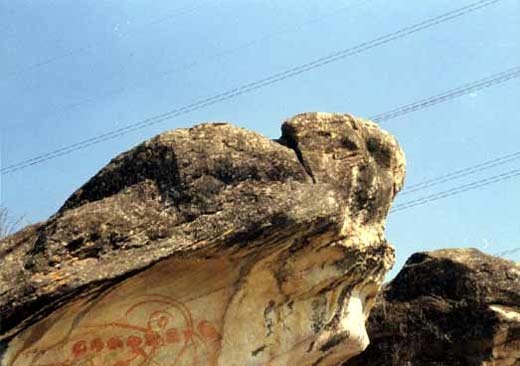 In Maharastra Inamgaon, Chandrapur and in Nasik one can find rock art sites. 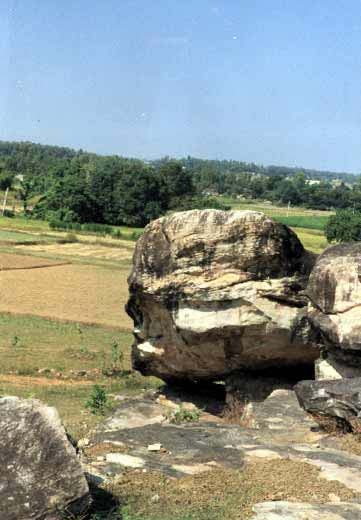 In deep south one can find rock art sites in various places in Tamilnadu, Kerala, Karnataka. Even rock art sites are reported in the north-eastern belt of Garo hills of Assam, Bengal, Manipur etc. Similarly in the northern most India rock art sites and petroglyphs are found in Leh, Kargil, Dras in Ladak. Thus we find with a pessimistic survey the whole India is carrying the heritage of rock arts which are a rare book of knowledge of the days of antiquity. The primitive artist primarily used mineral and vegetable colour. Moreover various pigments were used like hematite and other oxide to derive red, yellow orange and brown. In some rock arts one can find deeper colours which were obtained from oxides of magnesium. 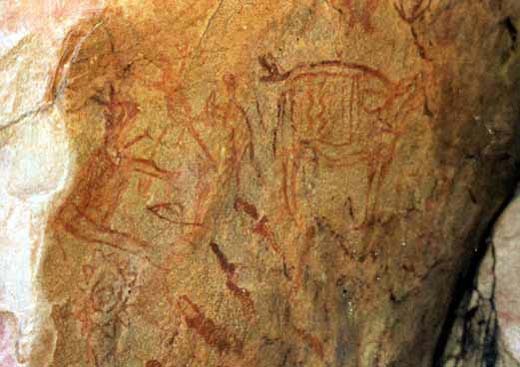 Prof. Malik referred that in the Bhimbetka Rock Art sites one can find some twenty one colours namely white, ashy white, creamy white, yellow, yellow ochre, raw sienna, raw umber, orange, dark orange, vermilion, scarlet, burnt sienna, emerald green, black crimson , crimson lake and purple etc. Human artistry heritage since hoary past remained a parallel endeavour beyond time and space. The most primitive men of even today carry out their endeavour around their shelters. If one has a close look at the Worli houses one finds the motifs of sun and moon and also the stick man concepts which we find in historic and pre-historic rock art sites. Similarly, most primitive culture kept their aesthetic talent intact without allowing any interference from the so called ‘progressive world’. Prof. Malik in an article explained the context of cultural proximity between ancient rock art sites and traditional people of the present era. He said ‘...the fundamental art tradition persists by way of contemporary ‘folk’ and ‘tribal’ in oral ways, such as amongst the Warlis, Santhals, the Gonds and so on. 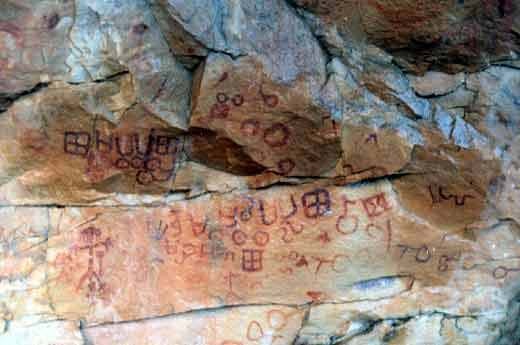 In short Rock art may be seen as a part of a living tradition, in terms of local histories and in the understanding of the psychology and history of humankind. It is the universality of the medium and the message within this global creative urge that holistic thinking and alternate methodologies may emerge’. After understanding the ‘cultural proximity and continuum’ let us try to delve into the motifs of rock art sites which not only gives a pictorial reference of the then times but also tries to record ‘the thought of the upper mind’ as well. For prehistoric man, existence was marked by a struggle for survival in a largely hostile world. During the Ice Age, the animal population was greater and men were forced to live together in small groups. Life was conditioned by the search for food, entailed a daily struggle against the little known and largely controllable aspects of nature. Archaeological findings about pre-historic man, do tell us the then world of animals and human endeavour be it hunting or attacking some animal etc. Apart from hunting, there are evidences of dancing alongside with symbolic musical instruments etc. In Indian rock art one can see spiritual movements of triangles, circles and Suns and Moons. The symbolism of ‘Shakti’ or mother concept is also found in the Paleolithic shelters of 10000 year old. Moreover, the cosmic context is explained in a Jaora rock art where fish, lotus stems, flying birds etc are see. On the human angle one can seat Karnataka the courting human being, men at war or a procession or ceremonial walk etc. In Chatraubhujanath Nala,in Madhya pradesh one can find bullock-carts or chariots are found. Another dominating motif of Indian rock art is deer which are drawn mainly X ray style. Yet, most portrayals did not reveal perfect anatomical positions. However according to Neumayer, the most accurate X ray painting is in Kathoti a where the deer’s digestive tract contains fodder in the stomach. Yet, deer with beautiful geometrical body decorations are also abundant. Rock art in Mrzapur, depicts the deer in a non-naturalistic style, in different postures and scenes. Indian Rock art, thus, give tremendous clues to understand the then era be it their life-style, entertainment or the mysticism. The detailed concepts of animals from ‘filled’ types to ‘stick’ and ‘x-ray’ types are found in abundance which are some time parallel to the universal movement of rock arts. One can find animal motifs of different kind which are today extinct. I recall, having seen rhino in the Rock Art sites of Son Bhadra which cannot be found today. There are ample references of weapons and head-gears including ‘hunting’masks of animal kind. These are drawn in varied colour temperatures and depict various horizons of aesthetic endeavour. There are many motifs which are overlapped with other era drawings. Thus finding and accurately dating each motif or symbol is not possible. But they remain a vibrant collage of the then era. Rock Art heritage of India, remains an infant as per recording and ‘rediscovery’ of sites go. Yet, they project, an ample scope to invite tourists from world over to witness the then era of prehistoric kind. Sordidly enough none of the Rock Art sites have been incorporated into the Tourist Map of India but if those sites are maintained and preserved as ‘ heritage parks’ then the world would be able to read the open aesthetically created ‘dossiers’ of our ancestors!